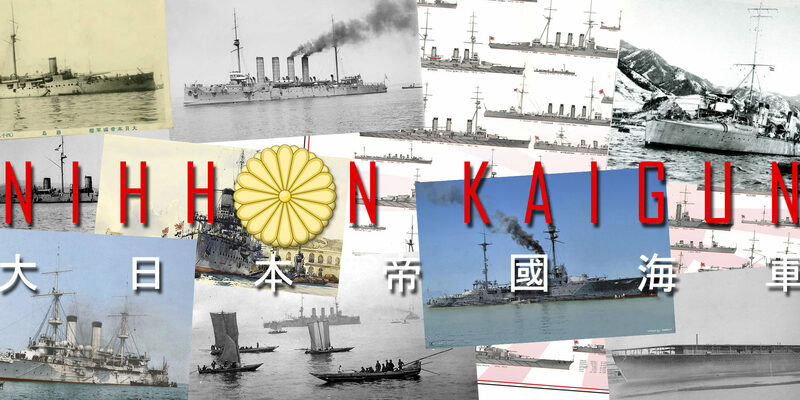 Nihon Kaigun, the Japanese Navy, originated in the opening of the Meiji era at the end of the 19th century. In 1853, Commodore Perry arrived in Japan, in the Bay of Uraga, and forced this still feudal country to trade with Western great powers. The civil war between nationalist and traditional clans and the Shogunate, the government, ended in 1869. 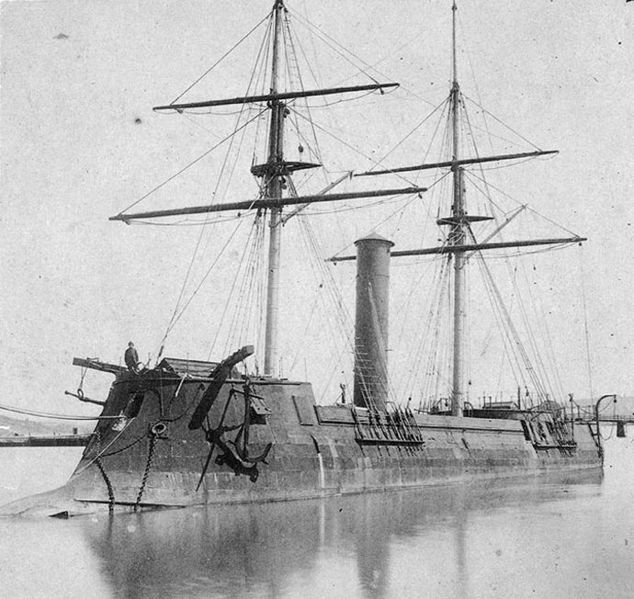 A small force consisted of disparate ships: Adzuma, former CSS Stonewall built in Bordeaux, too late to take part in Confederate operations, captured and resold by the Union to the Shogun. This was the first Japanese ironclad. 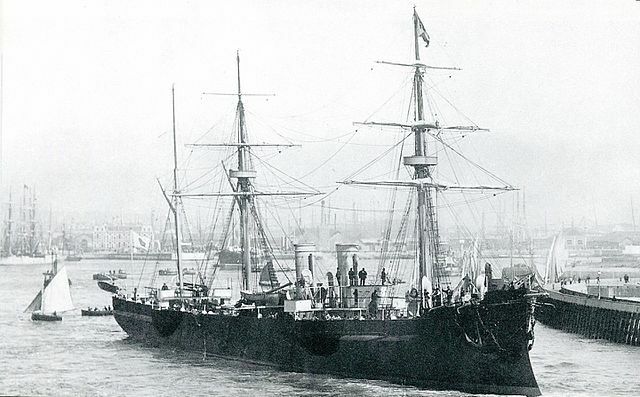 Another ship built for the Confederates in Scotland was the Ryujo. 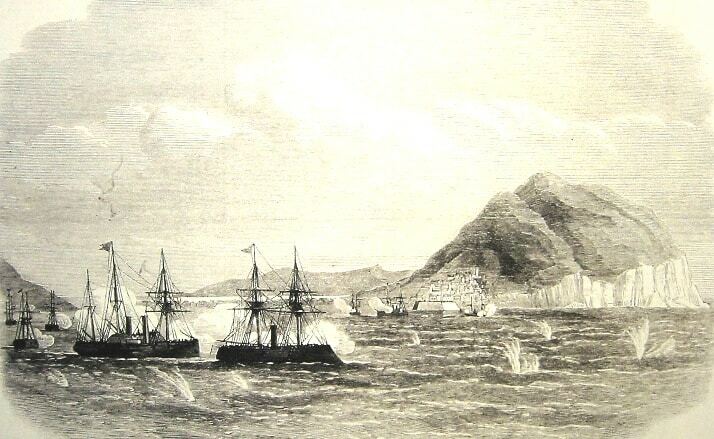 Battle of Hakodate. This decisive event in May 1869 for the Boshin war between the Tokugawa shogunate navy (rebel Ezo Republic) and the newly formed Imperial Japanese Navy (which won). 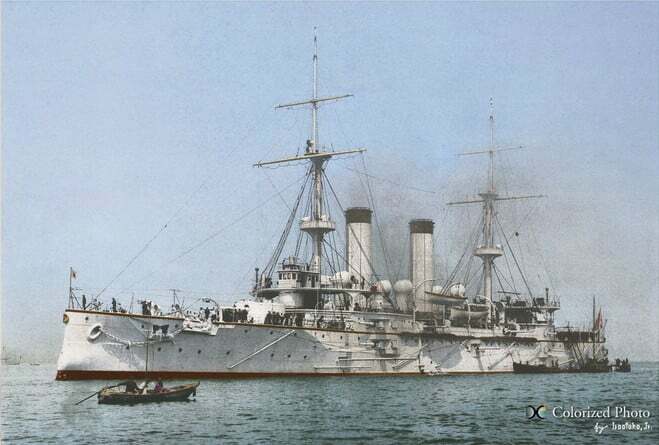 The Fujiyama was a mixed frigate, the Kasuga a wheeled frigate, the Tsukuba a screw corvette, the Chiyodogata, Dai Ichi and Dai Ni Teibo, Moshun, and Hosho were mixed gunboats. From this embryo blooded in the Boshin war, was born a new fleet relying in burgeoning industries. However, shipyards lacked experience and did not deliver their first ships until 1875, except for the small Chiyodogata. Ships of the line and battleships were still built in Great Britain until 1906. For its armoured battleships, Japan first appealed to the French engineers. The latter built the Adzuma, Unebi, the three Matsushima, the Chishima. The Germans, in addition for supplying their excellent Krupp guns, also delivered the Yakumo, and the Sai Yen. 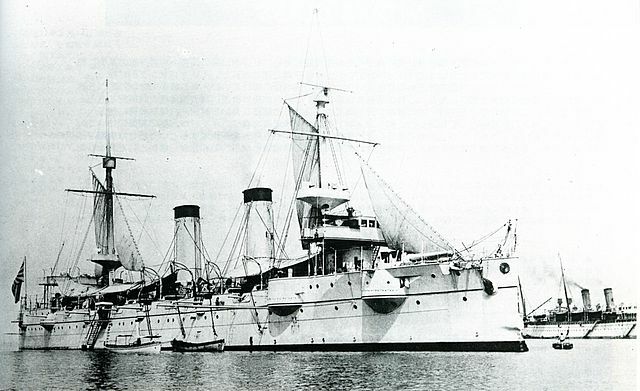 The Italians supplied the two Kasugas. The others were of British, American, or of local origin: Yokosuka, Kure, or Kobe. But Yokosuka Yard held the vast majority of orders thanks to its British configuration, British-formed engineers and shaped like Armstrong, Elswick. In 1905, the Japanese navy was already of a substantial tonnage, but it was barely enough (certainly not on paper) to face the heavyweight of the east then, Russia. Japanese officers then demonstrated the excellence of their tactics modelled on British ones, but with a very aggressive approach, and shut all critics about this “purchased navy” held so far (Article to come soon). Tsushima was also a spectacular geopolitical revelation, the door that the archipelago sought to enter the concert of the great naval powers and imperial powers of the time. This became a national yearly celebration and turn tables: After 1898 showed Europe has now to count with the new world, it was Asia’s turn to blew up European supremacy on seas. No wonder these two navies counted so much in WW2. At that time, Japan’s energy and resentment for its humiliating forced opening, and the emergence of a nationalist after the Boshin war, tried to achieve parity with the Western powers. She counted a British-trained, British-equipped, pitted against still potential enemies: Tsarist Russia although weakened remains one in 1907, China being out of the game since the 1894 victory, albeit two others were present, the US Navy in the Philippines and Guam, France in Indochina and the Netherlands in Indonesia. However diplomatically the USA remained the most active to bar Japan’s hegemony in the area. 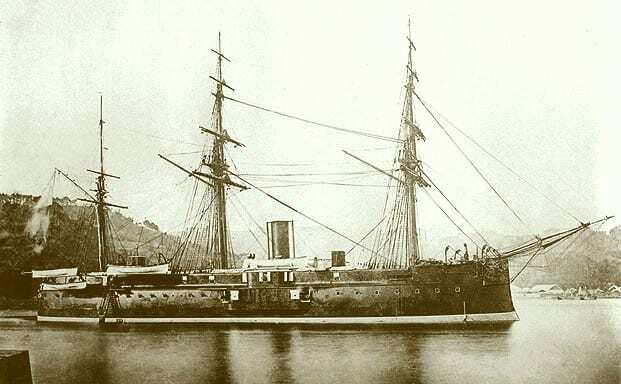 Local French influence, very present in the Boshin war and in the 1880s lost some appeal after the loss of two French designed ships and awkwards Young School ideas. The new government turned to the British at the end of the 1890s, an alliance was set up as well as influx in all areas. UK became the naval empire after which Imperial Japan modelled itself, while the Army was modelled after the Prussians (after France’s defeat in 1870). Navaly Academia, Eta Jima, was modelled after Darthmouth and it was current that officers formed themselves in the RN at the same time, at least once. Even naval aviation will be created in Japan after the British Semphill mission in 1921. That powerful influence was such that until 1930 bridge orders were often given in English and metric system was not adopted before 1921, British measurements being used before. From 1902, by force of a mutual assistance treaty and alliance, a worried British Empire by the rise of the Hochseeflotte could delegate the French Navy in the Mediterranean and did the same with Japan in Far Eastern waters. This explained why Japan entered the war on the allied side, despite tempting possessions still controlled by Russia. But default of allied ships in the area, japan took rapidly operations in hands against German possessions in the area, starting with the seizure of Tsin Tao and chasing of Graf Spee’s squadron our of the pacific (See below for Japanese operations in the great war); Japan saw this conflict in an opportunity to test large scale operations, although without an enemy to content with. Despite of this, Japan’s economic indicators were not so good in the meantime. The deception of the 1894 war in results, the ensuring stepped-up military program before 1905 weakened the economy, largely financed by a Chinese war indemnity. The 1900 Boxer rebellion expedition was good for national prestige but a costly affair. By 1905 an embargo prevented the delivery of war materials and equipment. After 1905 Japan was barely able to bear fruit of the result of the war, being bankrupt while Russia could still muster large armies. Japan emerged from its debt in 1910, only to feel the world economic depression surged in. The battleship Mikasa was arguably the world’s most powerful pre-dreadnought of its time when launched. It seems also shipbuilding was largely inefficient, costing as much as five times the amount consecrated to the Royal Navy, most of these finds being spent abroad. By 1906 High quality steel, ordnance and turbines were still deficient and had to be purchased abroad. 61% of the new battleship Satsuma was purchased abroad. Some ships had to wait for completion of were even put into service without guns. Kure’s delivery were then few in numbers. Soon the government emphasized industrial independence over all other concerns, Mitsubishi and Kawasaki purchasing licences by droves. This situation gradually improved in 1913 though. 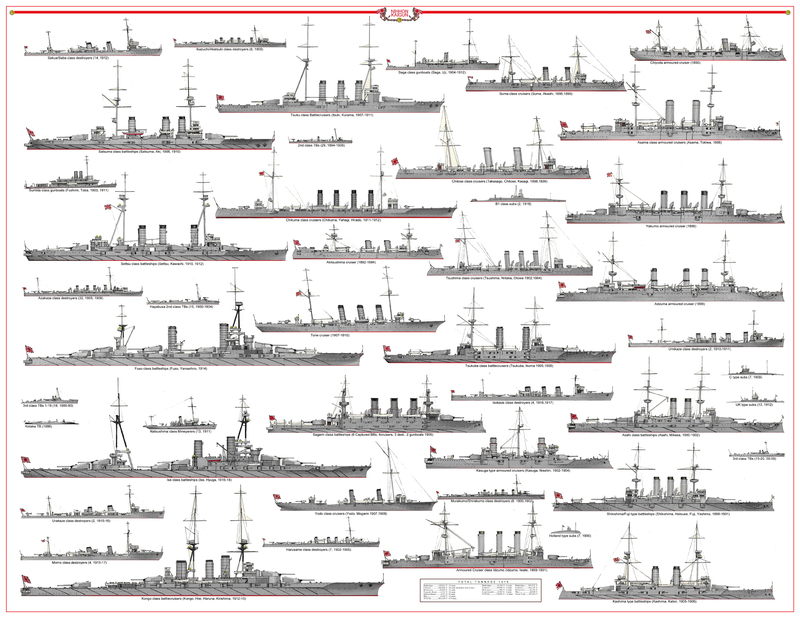 But prior to 1919, all major ships were still British-designed, with many British imports. Japanese engineers only gained maturity for true tailored designs after 1919. The fiscal year 1912 included the most ambitious shipbuilding plan: 7 battleships, 2 battlecruisers, but soon the cabinet reduced it to 3 battleships, no battlecruisers. Eventually in 1914 the new program called for a 8-4 plan (8 battleships, 4 battlecruisers) approve din the diet. An expansion was proposed in 1917 to 8-6. 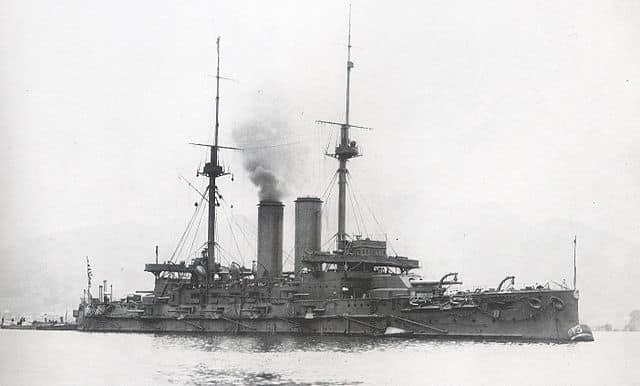 The Japanese fleet was reinforced by units captured in the Russo-Japanese war: 6 battleships, 4 cruisers, 3 destroyers, and 2 coastguards, which still inflated one-quarter of its already substantial tonnage. 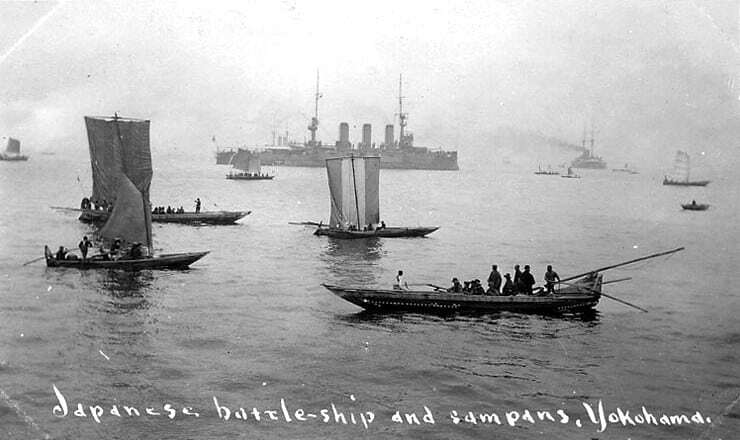 Widely inferior to Russia in 1905, the Japanese Navy entered the war in 1914 with a fleet that was almost double. 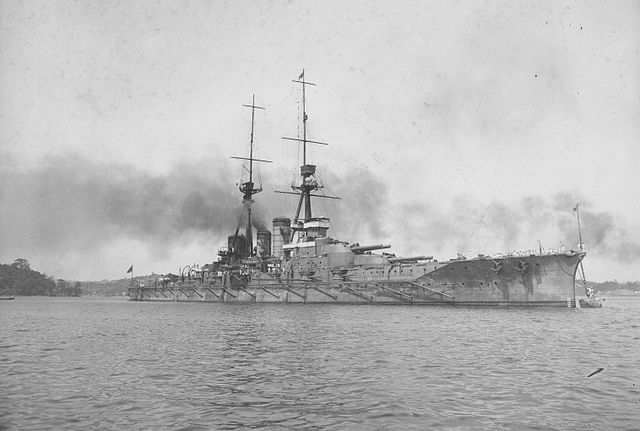 In addition to the catches of 1905, two pre-dreadnoughts Kashima, four dreadnoughts of the Satsuma and Settsu classes, four battlecruisers (Tsuku and Tsukuba) were added to the list, as well as a new class of four battle cruisers built in Great Britain, the famous Kongo. This class will soon be followed by the three more, of fast battleships. Added to this were the cruisers Tone, Yodo, and the two Chikuma. This completed a fleet of destroyers by more substantial units, the Asakaze class, of which 32 were issued. Subsequently, the yards devoted themselves to heavier destroyers, destined to the role of squadron leaders: The 4 Umikaze and Sakura. She could also count on the old cruiser Chiyoda, the Yakumo, the Adzuma, the two Asama, the two Kasuga, cruisers of the Suma, Chitose, Tsushima, Akitsushima and Otowa classes. 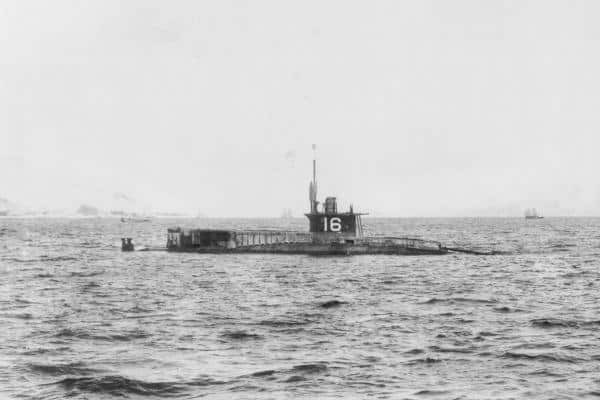 In addition, the two Matsushima (1890) kept in reserve were used for training. It also operated 17 old destroyers, Ikazuchi, Murakumo, Akatsuki, Shirakumo, Harusame, as well as first-class Hayabusa torpedo boats (15 ships), second class ships, 21-67 (29 units) 1-59 (30). Numbering matches have nothing to do with it. The Sagami and Suwo (ex-Peresviet and Pobedia, Peresviet class), the Hizen (ex-Retvizan), the Tango (ex- Poltava, Petropavlovsk class), and the Iki (formerly Nikolai I, class Imperator Alexander II), as a coastal defense ship. It also used ex-Russians cruisers, such as Aso and Tsugaru (ex Bayan and Pallada, Bayan class), Soya (ex-Varyag), and Suzuya (ex-Novik); Coastal defense battleships such as the Mishima and Okinoshima (Admiral Ushakov class), the Fumizuki, Yamabiko and Satsuki destroyers (Puilki and Boiki classes). The operative modifications consisted in systematically replacing the Russian artillery pieces by Armstrong models, standard of the Japanese navy. For battleships, the armored masts were also laid for simpler masts. The highest superstructures were lowered. Pre-dreadnoughts: Fuji (2), Shikishima (2), Kashima (2), Asahi, Mikasa. Ex-Russians: Iwami, Hizen, Tango, Sagami; Suwo, Iki. Coasters: Mishima (2), former Russians. Dreadnoughts: Satsuma (2), Settsu (2). Armoured cruisers: Tsukuba (2), Ibuki (2), Kongo. 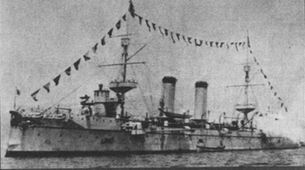 Armored frigates: Chiyoda, Asama (2), Idzumo (2), Yakumo, Adzuma, Kasuga (2), ex-Russian Aso (2), Soya, Suzuya. Takachiho, Matsushima (2), Akitsushima, Suma (2), Chitose (2), Tsushima (2), Otowa, Takao, Tatsuta, Chihaya, Tone, Yodo and Chikuma. Classes Ikazuchi (6), Murakumo (6), Akatsuki (2), Shirakumo (2), Harusame (7), Asakaze (32), Umikaze (2) and former Russians. Coastal TBs: 2nd class N ° 21-67 (29) and 3rd class N ° 1-59 (30). N° 1-7 (Holland), No. 8-12 (Vickers). High sea: Saga. Coastal: Uji. Fluvial: Sumida, Fushimi, Toba. Minesweepers: Natsushima Classes (2) -11 during the Great War. During the conflict, the exponential construction curve accelerated further. It was clear that the Archipelago wanted to enter the field of naval superpowers. On paper, in 1918, it surpassed all the traditional marines and ranked third behind Great Britain and the USA. This was confirmed by the Treaty of Washington. 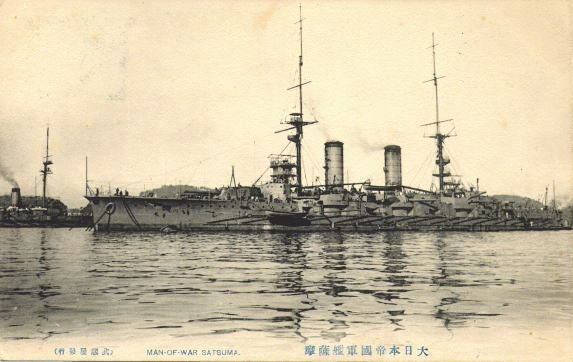 The world’s first all-big guns Battleship, Satsuma. Battleships: Largely inspired by the Kongo Battle Cruiser, built in Great Britain, the Fuso class, begun in 1912, was completed in 1915 and 1917. The next two Ise, completed in 1917 and 1918, were their repetition. Finally, the two Nagatos, begun in 1917-18, were completed only in 1920 and 1921, too late for the conflict but soon enough to escape the dark cuts of the Washington Treaty. 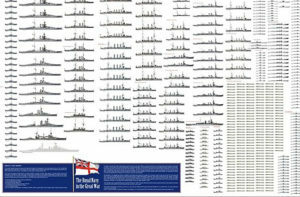 Battle Cruisers: The completion of the three other units of the Kongo class (1914, and 1915) is noted. The Hiei, completed on the 4th of August, was in a period of trial. Others were under study, but they were undertaken too late (see below). 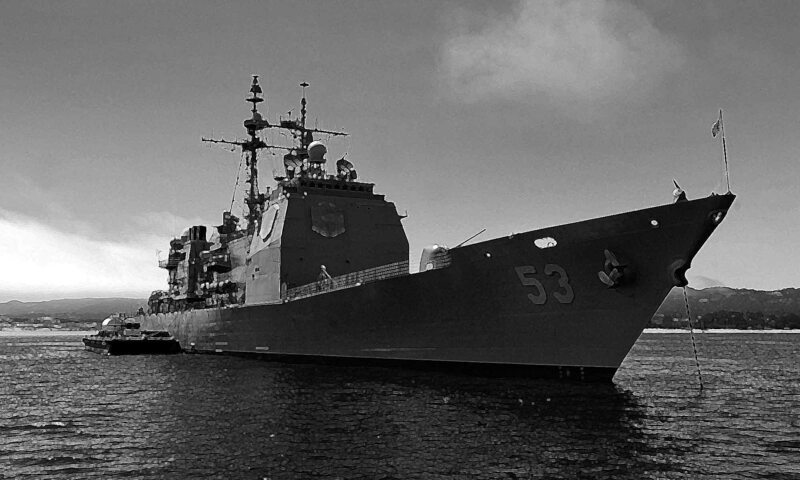 Cruisers: None were built early enough to participate in the conflict. As part of the plan for the Nagato, they were completed in 1919 for the first two (Tenryu), 1920 to 1925 for the other 9 Kuma and Nagara classes. 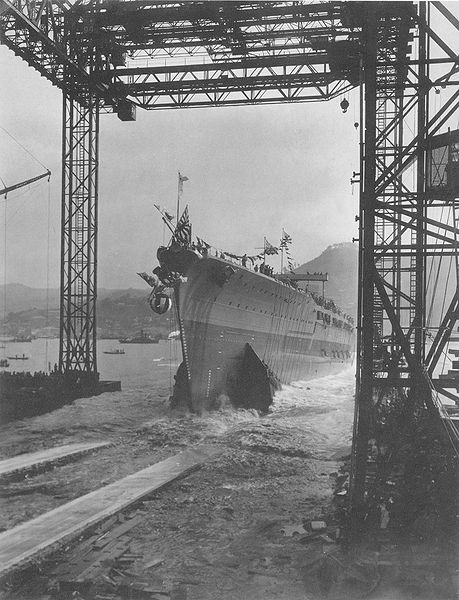 Hosho launch in 1921. This was the world’s first purpose-built commissioned aircraft carrier worldwide. Aircraft carriers: The Japanese Navy was one of the first to use it: In 1914, it converted a former British cargo vessel captured in 1905, then under the flag of Saint-André. Renamed Wakamiya and carrying two Farman bombers, launched from a small platform, this ship participated in operations against the German colony of Tsing Tao. The Hosho, much more famous, was in fact the first aircraft carrier in the world conceived from the start in this role (preceding the British Hermes HMS). Consequently, completed in 1922 alone, it was able to constitute after the war the nucleus around which the Japanese navy would build its naval strategy leading to December 7, 1941. Destroyers: The war production was not at the level of those of the RN and the USA: In the 10 Kaba, succeeded the 4 Momo, the 6 Enoki, the 4 Isokaze, the 2 Urakaze, the 2 Tanikaze. All saw the conflict. On the other hand, his plan of 1918 planned to catch up with the allied navies, and saw the construction from 1919 to 1924 of Minekaze, Momi, Wakatake and Kyokaze. Aware of the potential of this new weapon, the headquarters detached a commission of study from the British, American, and French engineering offices. The first submersible Nippon dates back to 1905. It is the excellent model built by John Holland, now common to both the Americans and the British. N ° 1 to 5 (1905), bought from the Americans in spare parts, will be secretly transported to Japan by train and boat, and assembled at Yokozuka. They will be followed by N ° 6 and 7 built in Kobe and Kawasaki under supervision of Holland. The next stage consisted in 1909 of calling on Vickers-Barrow for the N ° 8 and 9, built entirely in Great Britain and brought back to Japan by cargo (C1 Vickers). The Vickers No. 10, 11 and 12 will be transported in prefabricated sections to Kure for final fitting in 1911. The C3s (No. 16 and 17) will in fact be built in 1916, but were already out of date at launch. These attempts resulted in the VK (Vickers-Kawasaki) type, the No. 13 completed in 1912. Meanwhile, orders were placed in France for Schneider-Creusot units, but the first completed version was seized by the France and reincorporated to its fleet under the name of Armide. N ° 15 and N ° 14 (second, the other was Armida not delivered) were the first real submersibles Nippons, type K or Kaigun. They were integrated into the Japanese fleet in 1917 and 1918. During the Great War the Japanese appealed to the Italians for their class F (F1 and F2, N ° 18, 21, 31-33), put into service late in 1919. All the others will be part of the mass naval plan of the years 20: The “L” class, inspired by Vickers-Kawasaki (9), K, “Kaigun” specifically Nippons on a design based on the Schneider-Laubeuf model, more modern in their eyes. These were K1 (2), K2 (3), K3 (10), K4 (3), and KS mine-miners (4) built between 1917 and 1924. None participated in the operations of the Great War. It should be noted that the Japanese received German units as war damages after the war: Coastal U46 and 55 (O2, O3), two small high-seas UBs (O6, O7), three UC miners (O1 , 4, 5). 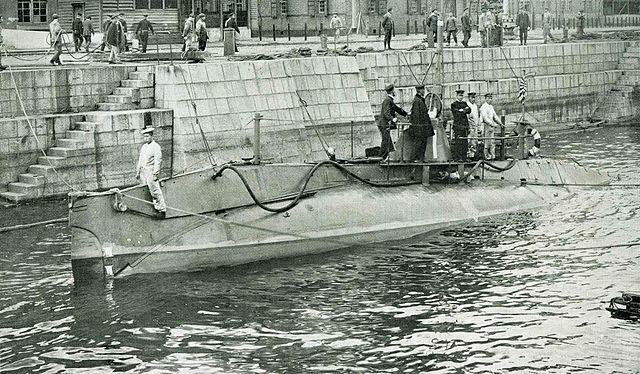 But especially they obtained the plans of the U-Kreuzer of 1917-18, formidable oceanic submarines which inspired largely the types built from the mid-1920s: The I-1 was virtually a copy of the U 142 . 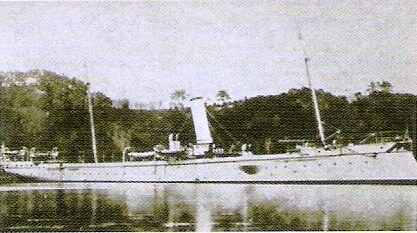 None during the conflict but The only high seas gunboat built afterwards will be the Ataka (1922) and the 4 Seta river. 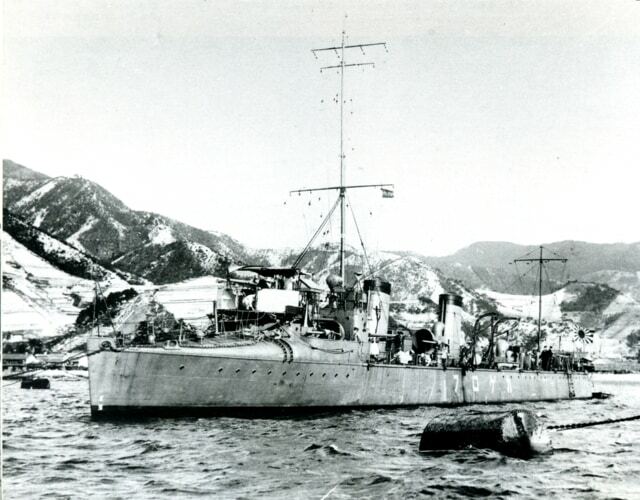 Minesweepers: Class Natsushima (11), continuation of the series injected in 1911, the minesweeper Katsuriki (1916), and 10 armed cargoes requisitioned during the Russo-Japanese war and reactivated, as well as 12 gunboats from Of requisitioned vapors, and a hundred trawlers armed in 1914-18, of which 33 were kept in service until the Second World War. The first Japanese VLTs were bought after the war from the British Thornycroft CMB (1920). The seizure of Tsingtao was a major amphibious operation planned by Vice-admiral Baron Kamimura, landing 23,000 Japanese and 1396 British troops but the base only fell on November 1914. Because of the base formidable defences, the Japanese lost the cruiser Takachiho, destroyer Shirotaye, TB 33. 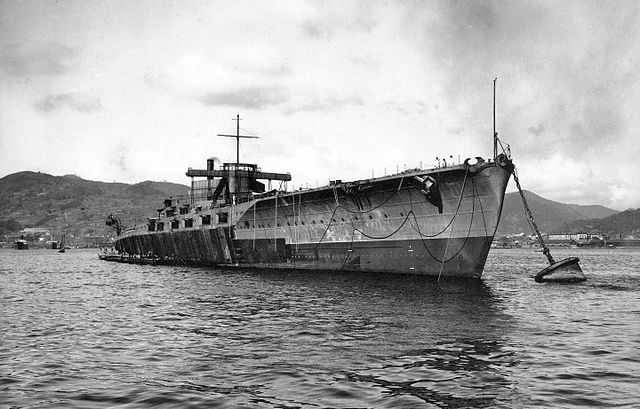 She also used its first seaplane carrier, the converted Wakamiya that fleet performed observations but also bombing missions over the town and was credited for the accurate naval support fire all along the operation. Japan’s 1st fleet also took the German possessions in northern Micronesia, Marshall and Caroline Islands early on (at the outbreak of the war) to cut off all possible retreats for Von Spee’s squadron. 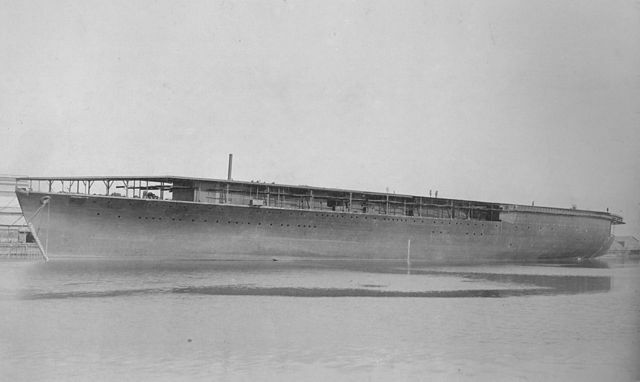 Seaplane carrier Wakamiya. Japan did the world’s first successful sea-launched air strikes. 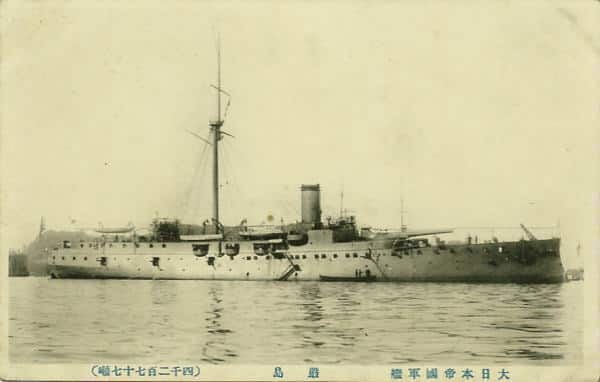 Japanese vessels of the third fleet helped escorting Australian troops all the way to the middle east, and despite the fall of Tsintao and departure of Spee’s ended all threats on trade in the whole pacific, the Japanese Navy remained active, at least by doing patrols and large scale exercizes. At one point in February 1915 they helps the British to tame a rebellion in Singapore. By 1917 however the battle of the Atlantic meant allied ASW was stretching thinner by the day. A desperate British Admiralty went on to call the IJN for help there, especially destroyers. These were committed in the Mediterranean first, and a whole fleet arrive at Malta comprising the cruiser Asahi, and the 10th and 11th destroyers divisions (8 ships), on April 13. Later in Autumn they were joined by the Nisshin and 15th destroyer division (Momo class). Improved Momo types were even ordered by the admiralty with these ASW duties in mind while the french, also desperate, purchased 12 Kaba-type destroyers (called “Arabe” class). 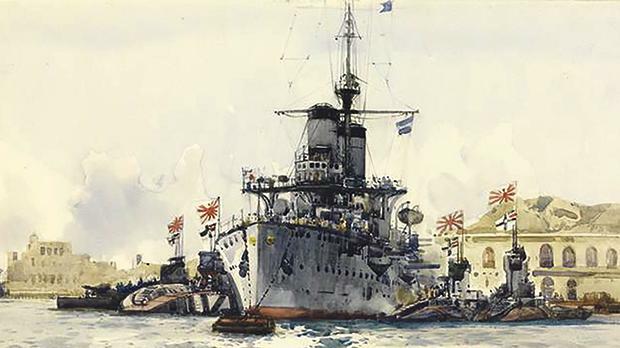 This went as far as the Admiralty, headed by John Jellicoe, asked the Japanese to loan all four Kongo class battlecruisers, which was flatly refused. Japanese ships secured traffic between Marseille, Taranto, and ports in Egypt until the end of the War, escorting 788 allied transports. 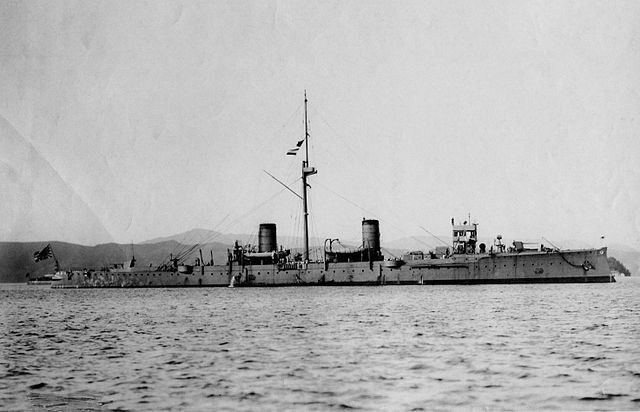 One single loss, destroyer Akashi, was by a German U-Boat 11 June 1917. There is still today a small commemorating plaque in Malta. 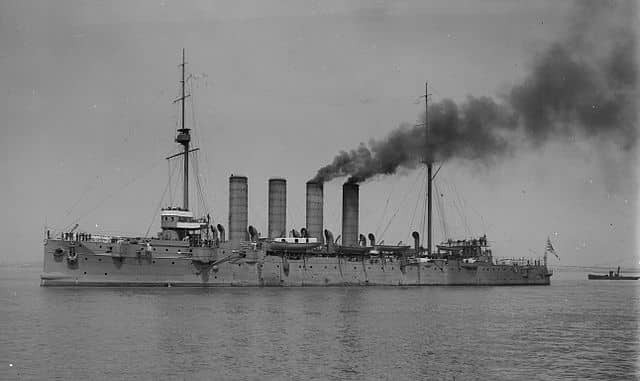 Also cruiser Azuma escorted troopships in the Indian Ocean between Singapore and the Suez Canal. This help was rewarded after the war through reparations taking the very helpful shape of seven German submarines of various types, including large oceanic cruiser ones, which were carefully studied. In light of this, all interwar Japanese submarine development is a product of this reverse-engineering. Japan’s ambitions in Asia also received a default greenlight, without interference by any naval power at the time. In 1915, under her big gun’s threat, Japan imposed China a special status. On April 1918, hoping some gains in Eastern Russia as well, Admiral Kando landed 500 marines in Vladivostok to help secure allied interests against the Bolsheviks. On August, 3, a whole contingent of 70,000 was also landed, which remained there until 1922. This created a sense of legitimacy over claims in this area and the Sakhalin Islands. It was thought in many HQs that the Japanese deliberately had the intention of using the revolution’ vacancy of authority to seize the whole of Eastern Siberia for herself. However their only resisting force in that area since 1915 has been the US. The latter refused any hegemonic extensions from 1915 and also questioned their alliance with UK which would have presented serious issues in case of an open conflict. So as part of the Washington treaty in 1921-22 a new agreement between the US and UK (which bring them parity in tonnage) also ended the British-Japanese alliance, compounded by a lower tonnage authorized, which was deeply resented. Also following this the UK made serious provisions and foresight for a possible Japanese will to seize British possessions in Asia. The roots of 1941’s Japan entering the war were forged there. Few units valid outside the line ships were produced; It was not until 1919 that the great program of mass construction was launched. In just four years, until the Washington treaty, the Nipponese navy moved up to the level of the biggest, USA and Great Britain, with the firm intention of possessing an Asian empire. This rise in power resulted in the placement at Pearl Harbor of the best units of the US Navy, the five brand new dreadnoughts of the battleship row. The most astounding construction programs concern the ships of the line: Of purely Japanese design, with the long experience of a British design, the plans envisaged the exit of the 2 Kaga to succeed the Nagato 406 mm, 40,000 tons), begun in 1920, launched in 1921, but whose completion was abruptly stopped early in 1921 because of the Treaty. The 4 Kii were even more remarkable, 250 meters long for 48,000 tons at full load, they could theoretically spin 30 knots, predicting the battleships of the late 30s. The battle cruisers, with sufficient protection, could be considered as truly modern, fast battleships for ww2 standards: These were the four Amagi, armed also with ten 406 mm pieces, and four more (unnamed) armed with eight 457 mm pieces, a caliber that emulated the British St Vincent and the Americans Lexingtons. The two most advanced of these, Kaga and Akagi left unfinished and planned to be broken, became the first large carriers to follow the Hosho. Tosa construction stopped in 1921. It was even compounded by the fact Japan did not respected limitations and therefore could built even costlier ships, without restrictions and armament and tonnage. In the meantime, its merchant marine grew from a million in 1905 (1300 steamers, 3500+ mixed/sailships) to 3,350,000 in 1921 mostly modern, large steamships. She double the number of enlisted sailors at 64,000 in 1916 and more than 35,000 in reserve in 1919. At that time she counted many new naval bases/shiypards, Kure, Yokosuka, Sasebo, Maizuru, Ominato, Ryojun (Pt Arthur), Daison, Chinkai (Korea) and Bako (pescadores islands). Model of the planned Kaga class battleship, an improved Nagato. As for the plans for mass construction, they set up the strength of the future fleet of 1941: More than three-quarters of the units deployed during the Pearl Harbor attack dated from that time. We know what happened next.